Princess Yachts have never been short on style and luxury, inside and out, but the new F55 Flybridge Motor Yacht sets a new standard in the 50-foot sport yacht market. From sleek exterior lines to amazing accommodations in the salon and cabins, the 55MY is one of the most well-planned and technically advanced yachts ever to come out of the factory in Plymouth. With larger windshields, a curved shape to the hull-side windows, and a stylish arch that is atop the flybridge make the new 55MY are a shift from the normal Princess look and shows the direction that the Princess designers have started to take this iconic brand. Positioned between the 62 Flybridge and the 49 Flybridge, the Princess F55 is a perfect option for the owner/operator looking to move up from a smaller express yacht. The flybridge of the Princess F55 is the centerpiece of the boat and likely where everyone on board will congregate. There are two main seating areas on the bridge, one aft that includes a spacious dinette with a teak table for al fresco dining and the other a U-shaped seating section that can also convert into a sun pad. U-shaped seating adjacent to the flybridge helm station also gives guests the option to sit with the captain while the trip is underway. Heading inside the 55, the salon layout matches that of the 62 Motor Yacht with walnut finished walls and furniture and clever features like a coffee table that converts to a dining table. The galley has all of the cooking features needed for an extended trip like refrigerator, freezer, stove top, oven, and lots of storage. It is also placed aft in the interior which makes the counter top an aft cockpit wet bar once the sliding doors are opened completely which also makes serving guests eating outside much easier. Below the main deck, there are three staterooms and two large heads with the master cabin getting the private en suite bathroom. The master suite stretches the full beam of the boat and boasts a large double berth, dresser for clothes, and a dinette with two seats for eating or reading. The VIP stateroom is equally as luxurious and is placed forward which gives a second couple on board extra privacy. It also features a double berth and ample storage beneath the mattress and in cabinets that line the room. For a hired captain on board, there is a snug crew quarters that includes a single berth and a separate head. Owners have a choice of power options on the 55 Flybridge including either twin Volvo D13 800hp engines or twin MAN I6 800hp engines, both of which push the 55MY to reach a top speed of 33 knots. 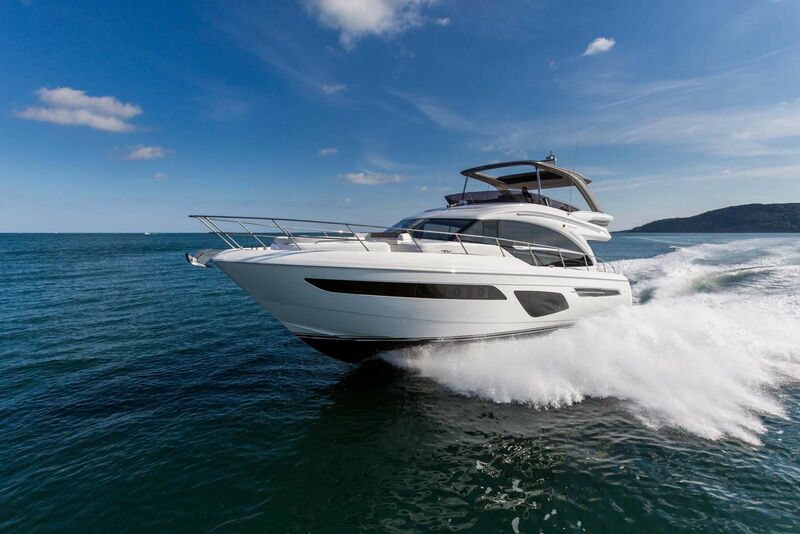 For more information on the new Princess Yachts 55 Flybridge, please contact your Staten Island Yacht Sales Professional. 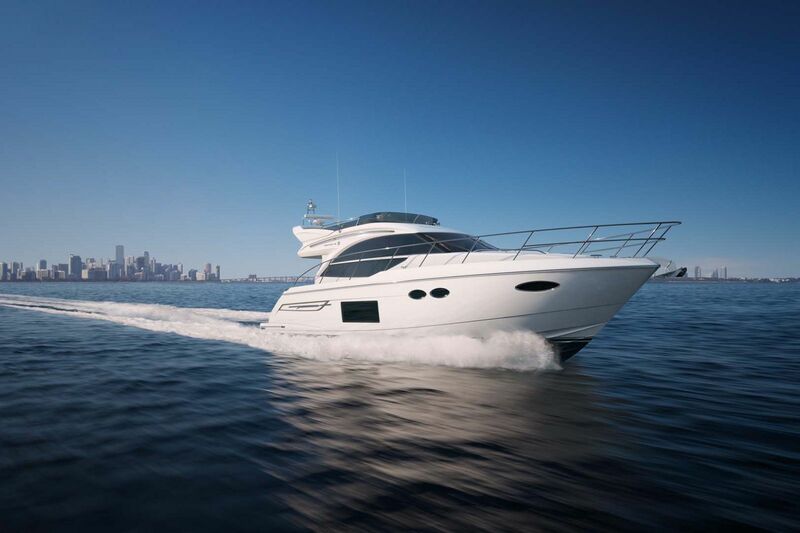 Motor Boat and Yachting magazine does an in-depth review of the Princess 55 flybridge. BoatTube does a quick walkthrough of the new Princess 55 Flybridge.